What Folks Said About "No Job for Jesse"
Wondering what folks said about the Interpretive Reverberation by Steve Van Matre? Those comments, along with a few of our own, can be seen if you click one more time…and find out who won the book Interpretive Design and the Dance of Experience. Challenging conventional layouts is something we should all embrace. Let’s look for partners to experiment with as guest curators. This is the last of the 2018 gifts -we hope something piqued your interest. Please let us know your favourite input or image and how you plan to use it in the coming year. A resolution, perhaps. Signs, signs, everywhere signs. Are they getting noticed or ignored? Sometimes they need to pop out. Being memorable is important and shape can help by drawing attention to it. Not only, a different shape, but one that portrays an image connecting directly to your site’s message and mission. You want to draw the eye and stimulate the mind. You can direct people with an impersonal arrow but so much better if you employ a person, even if it is a cutout, and one with a heritage look in keeping with your site historic timeline. Using a hen profile grabbed this passerby’s attention and piqued curiosity. 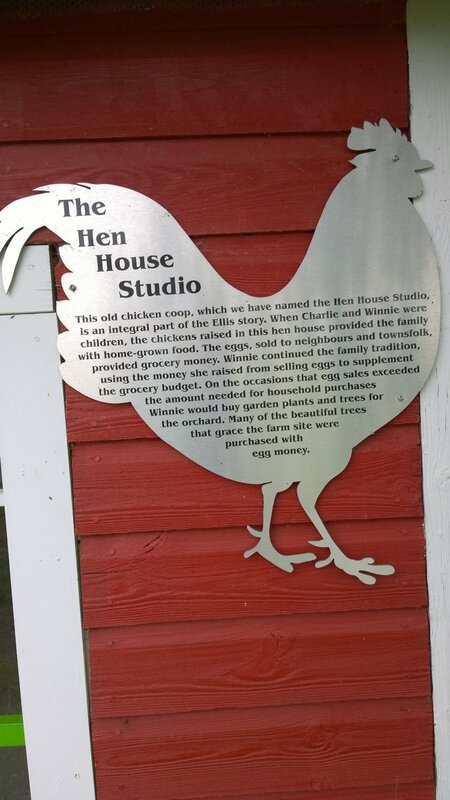 This was a clever application as the backdrop for the textual explanation of the re-purposing of a chicken coop into a studio. Avoid reader fatigue by not trying to cram too much text using too small a font with no white space. An egg (or two) with text could have reduced and relieved the text tightness within the hen body. We hope that the varied selection of images and topics over the month of December has put you more in the state of design mindfulness as you go forward in your interpretive endeavours. 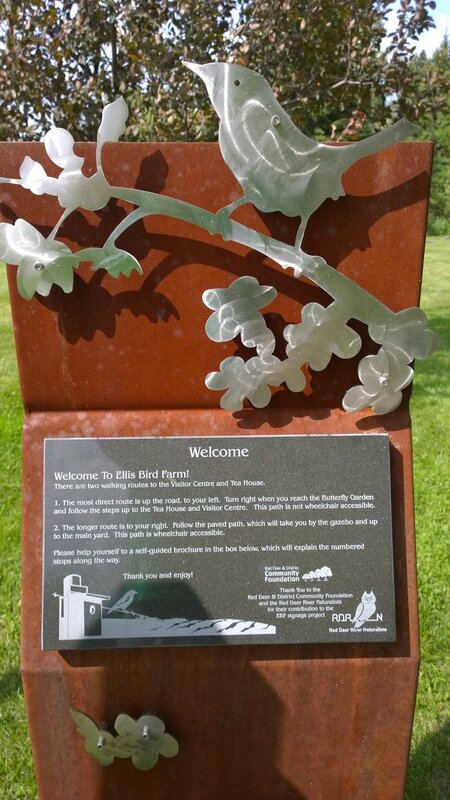 Who better to welcome you to a bird conservation and education centre than A SONGBIRD - even better if it had been in the act of singing the welcoming praises of the Ellis Bird Farm. To improve the chance that visitors will read a key site management message, why not give it importance by framing it and shaping it differently. Using the shape of a wine bottle at a winery works well. Changing font size can also work as a standout technique but be cautious not to overdo this. In my experience, welcoming visitors to our parks is seldom stellar. They arrive on our doorstep with great anticipation about what they are going to see and do and they are usually hit with rules and cautionary notes. Here are things you are not allowed to do and by the way the fire risk is this, the animal danger is that and such and such a trail is closed. Have a nice day ! Yes we need to provide this side but should it predominate? So we were given the bad and the ugly, now where is the good ! How well are we balancing with the positive side of the visitor experience equation- the beautiful and enthralling aspects of what to look forward to when exploring this place ? What kind of anticipation are we providing? On a recent trip to central Africa I was pleasantly surprised to see this welcome gate at Mikumi National Park in southern Tanzania. This park is not on the popular route in northern Tanzania where most foreign tourists go. The infrastructure is basic and the interpretive material is relatively non-existent. However, they outdid themselves with this entrance showing you some representative mammals on the left and typical birds on the right of the gateway, opening onto a landscape of discovery. There is even a small shaded water basin that could attract birds for a drink - they are not artificially feeding so they are not disrupting natural behaviour, yet simply providing a visitor watching amenity. This sculptural mural art form was a refreshing surprise. Providing anticipation for what might i see and what is being protected here in an attractive way is approaching stellar. Showing an Impala and Kudu mother and young along with a leopard not only introduces 3 species but also allows for a subtle entry into predator and prey relationships as well as animal life cycles. The word Karibu on the fence means welcome. How colourful, interpretive and welcoming is your front gate? This is a photo of a poster mounted on a bulletin board close to the entry of Ruaha National Park also in Tanzania. What is striking is the fact that the park is sharing new scientific information upfront for the visitor-a sort of “be on the lookout for” - the interpretive execution is not exemplary but the intent is. New species being discovered is significant from a park protection rationale perspective and increased exposure of this kind is important for the visitor to realize. Especially as visitors start their journey into their park, they need to know reasons why this place is special. Please share your novel approach to your gateway or tell us how this post was useful to kickstart a change in your outlook . Go for multitasking not just in your personnel, but from your building shell. Demand double duty from your support furniture, walls, and doors. The essence of your site needs to emanate from as many visitor interaction points as possible. In the previous post we saw how arresting a colourful wall display in a stairwell can be. Allow your walls a chance to engage with the visitor , however caution must be taken when reading is concerned and one is climbing ! Do you have any wall space that could be refreshed and turned into a stimulating quote? 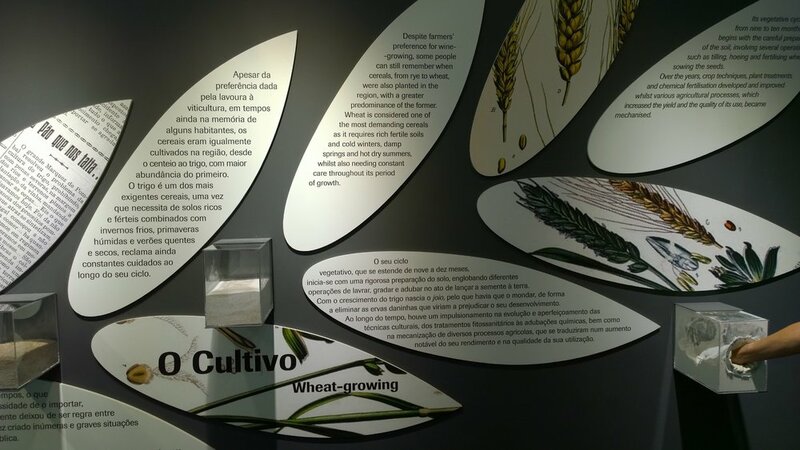 Sliding doors in a bread museum - why not fill them with wheat , as this interpretive centre did in Portugal, to reinforce in the visitors’ minds the connection to where bread comes from. Elevator doors: let them provide a landscape for getting your message across. The corporate guys do it- why not not-for-profits? 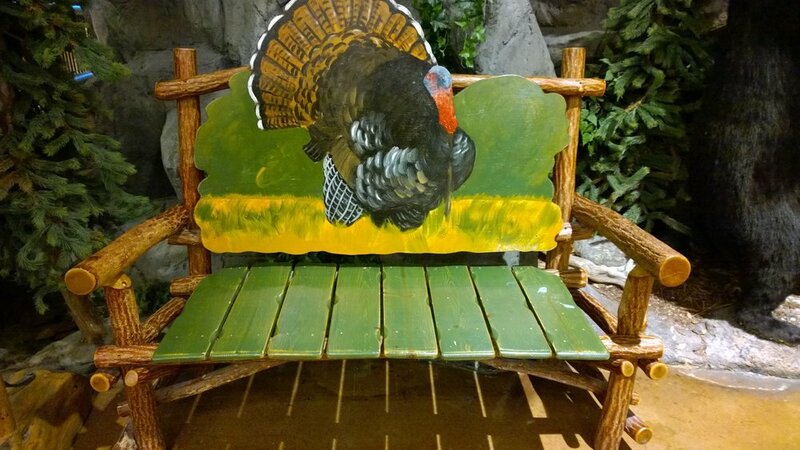 Benches can do more than provide a rest amenity- they can be a conversation piece or an interpretive billboard for your visitor. Selfie anyone? Send us your examples of double duty creative benches, walls and doors for sharing in the comments section. When dealing with “rules” sometimes simple is best - legible, neat and use of a natural tone for a natural heritage site, with an image that brings a smile to one’s face (instead of a frown). Please share any good examples with all of us in comments. 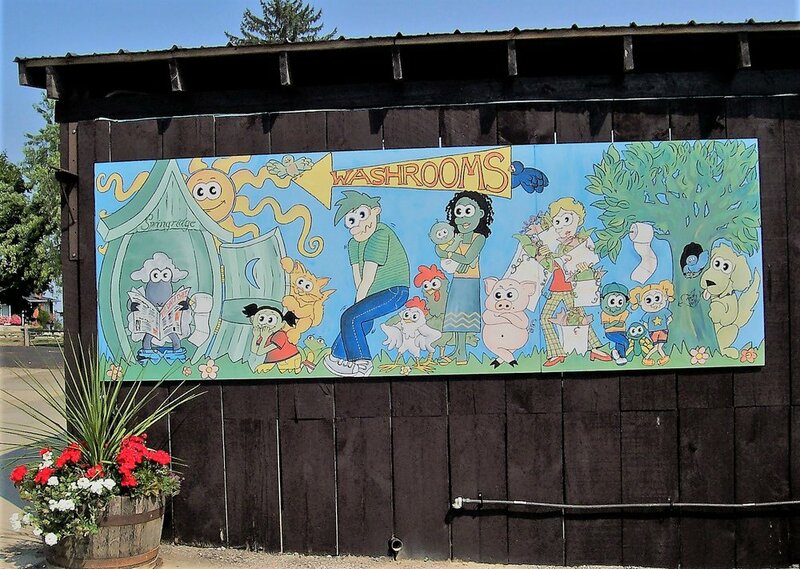 Sidewalks have potential to play a role in engaging the visitor and introducing them to your site’ s purpose. 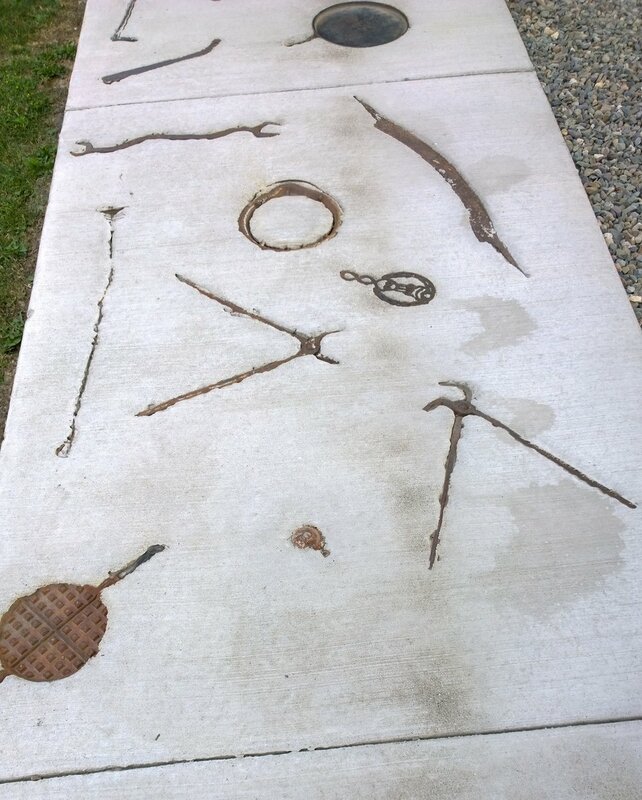 In the above sidewalk of a regional heritage museum, they chose to embed expendable artifacts into the concrete entryway allowing for inter-generational conversations and prompting a form of “what was this used for” type of guessing game. 1) Blank wall space in a museum stairwell (on a landing) allows for creative display extension spaces. 2) Table surfaces can allow for creative applications, in this case, for local artists’ exposure while you enjoy a cuppa. 3) Stair risers are often underutilized real estate. Powerful images can raise awareness about what you want visitors to notice or simply act as an uplifting moment in one’s life. This is the last week of insightful gifts and we have chosen a few images,captured in our travels, as the impetus for a more detailed look at design impact. The choices we make for operational fixtures, furniture and equipment like benches, chairs, washroom doors, doorknobs, lighting, flooring, refuse receptacles, etc. may seem inconsequential yet can add that little extra touch of humour, beauty, and concern. Ensure that as many of these supportive “amenities” connect with and reinforce the key “reason for being” messages of your site. Ultimately what you convey to the visitor is: we care about you. We chose items to make your visit special and to surprise you in a comforting way. We have added elements to raise the bar on enjoyment. The door handle that allows you entry into a rose garden resembles a rose flower. Benches have the potential to be evocative about their surroundings. Is it possible to provide too many opportunities for visitors to put something in their stomachs? You can be the judge of that question as we head over to the James E. Pepper Distillery in Lexington, Kentucky for a second tour and another look at the Dance Step of Hunger. Yesterday we were looking at the German Port Museum and how they may be falling in the trap of designing the building before producing a clear experiential interpretive design. Today we briefly look at the positive aspects of their approach to concept development and how this needs to inform building design. The new German Port Museum has a vision of open and transparent premises, where they can show large, high and heavy exhibits, along with a viewing platform to “provide visitors with a view behind the porthole.” Proponents want to portray the “incredibly large dimension of the goods handling, the port as a place of work and the further processing of products.” This is clearly direction-setting. They want to address the omission that the fundamental technical change in ports and port cities is rarely analyzed and represented in its current and historical complexity. There is a desire for the museum to depend on strong socio-historical and socio-political perspectives to enhance the traditional maritime museums’ seafaring focus usually on ships, nautical instruments, engines and machinery. As a result, they hosted an International Congress of Maritime Museums conference with a very clear goal. They selected papers from current port-related and world trade research in cultural anthropology, social and economic history, and industrial archaeology as well as contributions on innovative approaches in collection policies, exhibitions and educational programs of maritime museums. Bravo ! When was the last time (even on a small scale), you cast the net inviting a group with diverse knowledge around a topic to help you focus your interpretive content? This broadening of topics around globalization and world trade will be relevant to a wider range of visitor. We hope this “view behind the porthole” translates into an experiential spotlight on the web of people involved and impacted. Sharing their stories will be pivotal for engaging visitors. Mike will be sharing Part 2 of Dancing with Bourbon on Thursday and we are giving everyone a “long weekend” to savour that blogpost before we commence on Tuesday with the remainder of December’s gifts. Building design before experience design -why?? We have been talking about big issues in December, during our gifts of insight series and today is no exception from both a design perspective and a concept perspective. Let’s tackle design first ! What about a museum that plans to deal with questions of globalization and worldwide trade, in other words the big concept of exchange of goods, knowledge and people. Where better than a new museum covering the development of a major port city like Hamburg, Germany and its harbour. https://www.deutsches-hafenmuseum.de/de/home The German Federal Parliament’s budget committee approved 120 million Euros of funding to establish the German Port Museum. Except Hamburg already has five museums dealing with maritime topics, so some naturally questioned the need for a new museum, rather than enhancement of the existing infrastructure. However, a recent architect competition has been struck in typical fashion, to create a museum structure without an interpretive design plan. Our July 18, 2018 EID blog post reported on the Abraham Lincoln Presidential Museum that broke from the tradition of first designing the architecture of the building and THEN the contents within. Instead the visitor experience was designed first then the building was commissioned to house the immersive “experience” exhibits. Design the experiences first and then design the building is EID’s mantra. Deciding whether you need a new facility or a rejuvenation of all or some of what you already have, depends on solid visitor outcomes and a clear interpretive picture of the desired visitor experience. Multiple buildings with differentiated stories that link together and support an overall visitor experience could be powerful. Tomorrow’s post will continue by exploring the intriguing “view behind the porthole” content envisioned by the new German Port Museum. Are you afraid to confront difficult subjects? Do you desire to be a facility that is considered current, necessary and moving? Maybe you need to tackle topical subjects where there are varying opinions. Relevance in the community may require you to embrace controversy . A museum opened in Hong Kong last week that is clearly unafraid to confront difficult past events. Dedicated to showcasing the media industry this is the first museum of its kind in Asia. Called News-Expo, they do not shy away from politically sensitive news, with articles on the Chinese 1967 riots, the Tiananmen Square crackdown of 1989, and the Occupy movement of 2014. One intent is to to prompt discussion and show how major news events were covered by different Hong Kong media,. One clear outcome is the demonstration of the importance of the free flow of information as a cornerstone of Hong Kong’s success. Hopefully, they will cultivate the same popularity that the Newseum has done since 2008 in Washington, D.C. Considered one of the most interactive museums in the world and the “must-see” attraction in Washington, D.C., it has positioned itself as a leading champion of free expression in the world today. Two aspirational things jumped out at me when I looked over the Newseum website that would be positive for all heritage facilities. They claim that a visit to the Newseum is a conversation-inspiring experience you won’t find anywhere else. They claim that the Newseum’s unique approach to history, civics and media literacy helps students cultivate the skills needed to make informed decisions in a divided and demanding world. These two laudatory goals should be part of your interpretive strategy. Cultivating worthwhile people skills and stimulating conversation through experiential interpretive design is something all facilities should be aiming to attain. Their free online learning platform reaches more than 11 million teachers and students around the world. How do they accomplish this? Why not investigate NewseumED ? carbon-reducing action through an online self-monitoring platform. competitive multimedia games allowing them to become green lifestyle winners. Our fourth in the holiday series of insights. Every visitor point of interaction plays a reinforcing part. Do you use tickets or some form of confirmation of entry payment ? Have you thought about what additional purpose that item could play? When visiting the Museo Maya de Cancun, Mexico I was struck by their use of beautiful quality colour photographs on their ticket stub. They portrayed other heritage sites within the management responsibility of the Mexico Instituto Nacional de Antropologia Historia. For me as a visitor I was made aware of another heritage site I had previously not known about. This acted as an excellent way to cross promote visits to their partner sites. This ticket stub photograph idea could be used in many ways -what if you wanted to highlight items at your own place like various out-of-the-way artifacts or trail viewpoints or… With a little imagination this first contact with the visitor could really be employed as a site enticement, a curiosity stimulator or conversation starter. The Robert Bateman Art Gallery in Victoria , Canada uses the back of their ticket stub as a personal message from the Robert Bateman Foundation. They also used a colour image of one of Robert Bateman’s paintings to catch your attention. The opening remark "Robert Bateman sincerely hopes you enjoy this exhibition," was powerful for me and to tell you the truth shocking-in a very pleasant way. This was an attempt to have the artist speak directly to the visitor. The message continued with this as its core : " All proceeds go to the Bateman Foundation which operates this gallery as well as other programs, which recognize that a deep and abiding relationship with nature is central to the human experience." Another way for me the visitor to feel good about supporting this cause as well as getting an inside picture of the ongoing mission. of the place. The closing sentence "On behalf of all of us at The Bateman Foundation-thank you so much for coming." Simple, impressive and effective. By the way i highly recommend a visit, as the gallery employs a variety of presentation methods not commonly seen in art galleries. PS. Truth be told I have used both of the above tickets as mini-keepsake bookmarks. Our third in the December gift short series is a continuation about the Climate Change Museum. captivate the distant by illustrating unexpected links between climate and society, and facilitating climate conversations within and beyond our walls. animate the demoralized by providing hope with solutions-focused content, climate success stories, and opportunities for collective action. bring the experts together to help develop the next generation of innovative climate solutions and inspire new leaders. Ensuring you have a place in the public conscience means your institution becomes involved in important public conversations and avoids being left on the sidelines and forgotten about? How well are you seen in your wider community of providing attractive solutions to relevant social and environmental issues? Are there any audiences you need to captivate and re-energize? Any demoralized audiences you need to animate? Any experts you need to bring together for inspiration? Do you need a youth advisory council? The Climate Museum’s mission is to employ the sciences, art, and design to inspire dialogue and innovation that address the challenges of climate change, moving solutions to the center of our shared public life and catalyzing broad community engagement. This mission is exciting on so many levels, however we will focus on the strategy to form a youth advisory council to help them design the what and how to accomplish their mission. How do you bring young voices to the conversation? The museum had hosted a climate change media creation workshop for high school students. After the students wrote and performed spoken word, designed subway ads, and created plans for a climate-themed music festival, museum staff realized they needed to tap into the students’ energy level. The youth advisory council was formed. The museum’s vision is to be curated in part by and for young people to enable the public drawing together around the social justice, public health, and urban design challenges and opportunities presented by climate change. Do you have a youth engagement strategy? Tomorrow we will highlight the idea of curating attractive solutions -something Miranda Massie, the museum executive director sees as her job. How do you keep an exhibit up to date when data is continually rushing in? The American Museum of Natural History (AMNH) in New York city has tried to tackle the unfolding story so you remain up-to-date. Visitors to most spaces in the museum meander through space and time, however one hall was given a makeover with the purpose of having people think deeply about our current moment—and the dynamic processes that brought us here. Guess what the topic is - climate change. Guess who they turned to, to design the change? Interpreters of course - well no. The collaboration that created and prototyped new hall features involved scientists, user experience engineers, and educators under the leadership of the director of science visualization, and the vice president of exhibition (Of course some of those people may have been trained as interpreters but that is not how they refer to themselves). Find out more about how AMNH went about this. How have you solved this issue of staying topical regarding the subject matter you deal with? Are you staying relevant in your visitors’ eyes by keeping them in the loop with new advances ? >> More on climate change tomorrow. 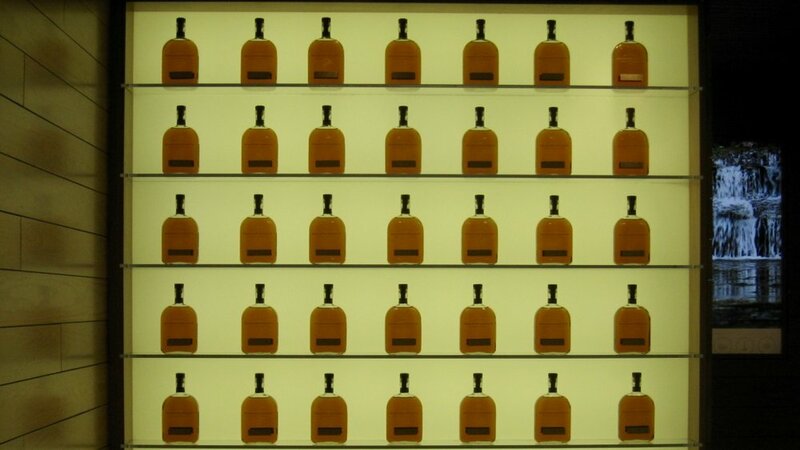 Who would have thought that one of the most carefully crafted Dance Steps on Hunger would be found at a couple of bourbon distilleries in Kentucky? Not me, but this pleasant surprise sent me back for more. 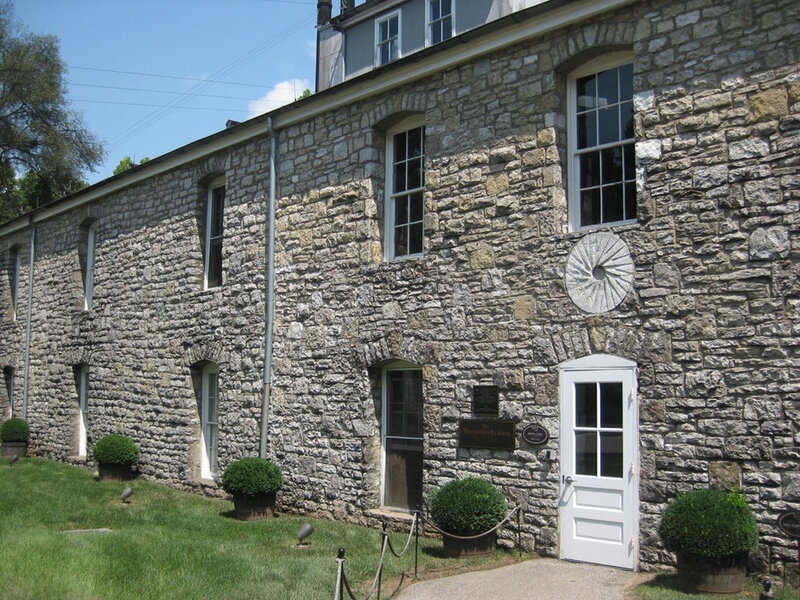 Both distilleries I visited, Woodford Reserve and James E. Pepper, are listed on the USA National Registry of Historic Sites and Places, and, of course, there is a deep cultural connection to bourbon in Kentucky. My first visit to the Woodford Reserve Distillery in Woodford County, Kentucky was in the summer of 2017. I was so impressed with the attention to detail during the Hunger Dance Step that I went back in 2018 for a second visit to make sure it wasn’t a fluke…and it was no fluke. Let’s face it, if you go to a distillery, a brewery or other food interpretive presentation, you want to taste the product and Woodford Reserve (WR) did not disappoint. As a matter of fact, the tour provided several opportunities to experience the flavorful aspects of the bourbon making process. Yes, I gained meaningful knowledge about making bourbon, felt welcomed and cared for, and even gained some tangible “skills” to share with others, but if it hadn’t been for the attention to detail at the Hunger Dance Step, I would not have returned for a second visit. Located in a beautiful rural setting surrounded by rolling green fields, grazing thoroughbreds, a meandering Glenn’s Creek, and a visitor center with the feel of “My Old Kentucky Home” (more on the center in a different post), Woodford Reserve epitomizes the Bluegrass State. As our tour entered the 1838 limestone building, you could smell the fermentation awaiting us on the second floor. After a brief description of the 5-Step Process from “grain to glass” for making bourbon, we ascended stairs to find three large cypress wood fermentation vats loudly foaming as yeast and bacteria were eating away at the sugars and carbohydrates in the corn, barley and rye mixture. And there, in front of one of the vats, was a white oak whiskey barrel with a jar full of the fermentation liquid (sour mash) with small wooden tasting spoons. Our tour guide encouraged us to take a spoon try the mash…taste #1. Next, we headed to a room with three large copper distillers. After a brief explanation of that process we passed around a glass with the clear liquid distillate (think moonshine, white lightening, hooch) to smell or even use another small spoon to taste…taste #2. Finally, after visiting the whiskey barrel warehouse and the bottling area, we returned to our shuttle bus and headed to the air-conditioned tasting room in the visitors’ center for one final splash of properly aged bourbon. + Two glasses with bourbon sitting on wooden staves from white oak barrels used to age the bourbon. + A piece of bourbon candy topped with a pecan sitting on a WR napkin. + A bourbon flavor wheel at each stool placed in a slot at the edge of the wooden tables behind the bourbon glasses. Our guide suggested some sensory appreciations before we imbibed. We held each glass of bourbon up to the light and examined the color, we smelled the contents, and finally, after a brief explanation of the flavors we might experience, (and a warning that the first taste would be spicy with a strong finish) we took our first sip of Woodford Reserve…taste #3. However, before taking that second sip, we were encouraged to take a bite of chocolate or even add ice if desired…taste #4. With the second sip we were instructed to note the various grains – the sweetness of corn, the spicy flavors of rye, and the hints of caramel/maple from barley. This time the finish would be smooth…taste #5. After a brief silence for “sipping,” a buzz of communication between strangers and friends filled the room – oohs and ahs, taste comparisons, “How’d you like it”, “Pass the water, please”. This encouraged a different kind of Hunger– our desire for social interaction, to express ourselves, to compare our experiences. Next our attention turned to the second tasting glass with the Woodford Reserve Double Oaked. After a brief introduction to the tasting wheel and some new flavors we might experience, taste #6 took place. Engrossed in the tasting, I kept reminding myself this was not Napa Valley but a Kentucky distillery near my hometown. Too soon the tasting was over. Our guide stood at the door to the main visitors’ center (set up like a living room with comfortable chairs and couches, a gift shop and small café), thanked each of us individually, and handed out feedback cards. A second staff member entered the room and began to set up for the next tasting as several folks remained at the table talking about the experience. The tasting was relaxing, fun, and no one rushed us out of the room. 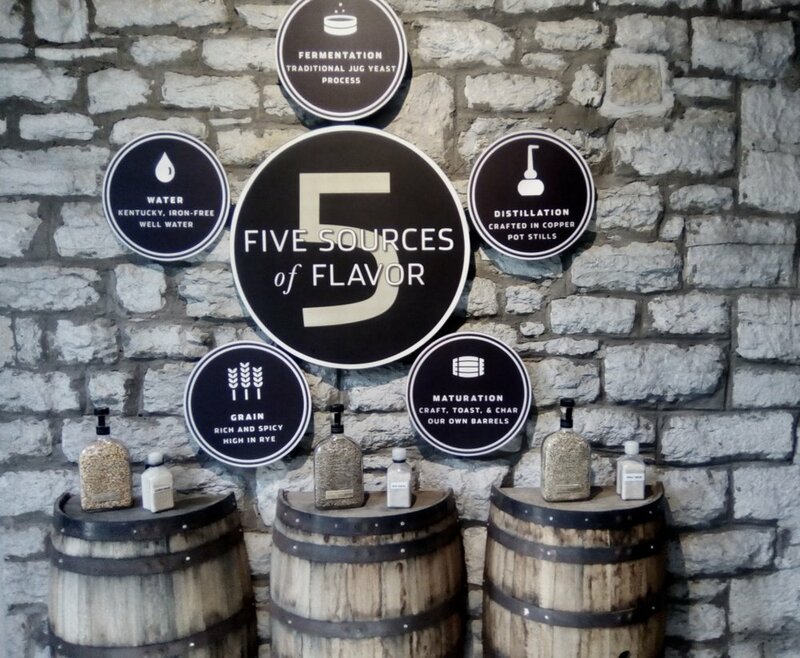 I watched as about half the folks headed to the gift shop to make a purchase that afforded even more opportunities to take home a taste of Woodford Reserve – 4 different kinds of spirits made on site; bourbon candies from Mt. Sterling, KY; bourbon barrel cherries, simple syrup, and five different bitters from a company in Louisville, KY. There was none of the typical “junk” food you find in so many preservation, collection and historic site gift shops and cafes. And the non-edible goods all reflected the focus of the site and the product (a topic for another post as well). 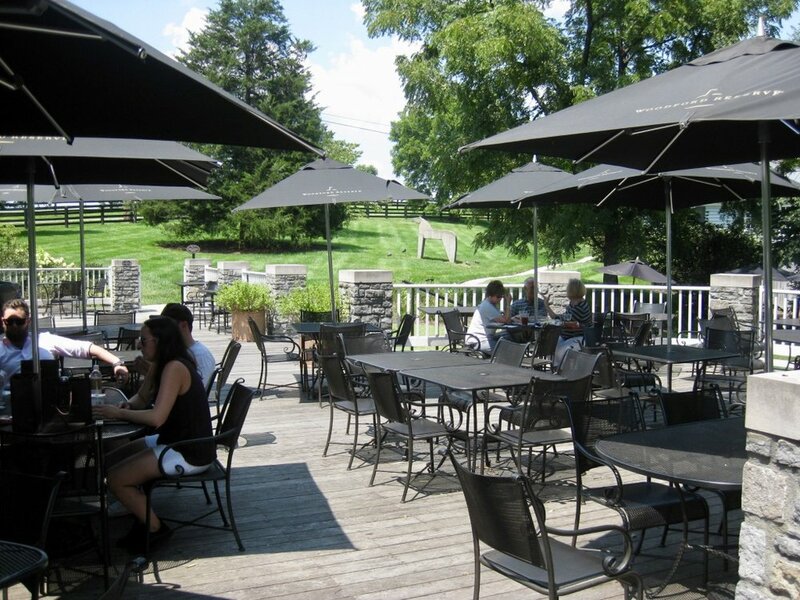 For real food the Glenn’s Creek Café (Glenn’s Creek runs through the property) offers soups, sandwiches and salads that capture the essence of WR and offers comfortable indoor and outdoor seating with a view. There is chili with Kentucky beef, bourbon infused barbeque sauces and dressings, and Bourbon Honey ice cream produced locally. Why am I spending so much time focusing on the Hunger Dance Step? 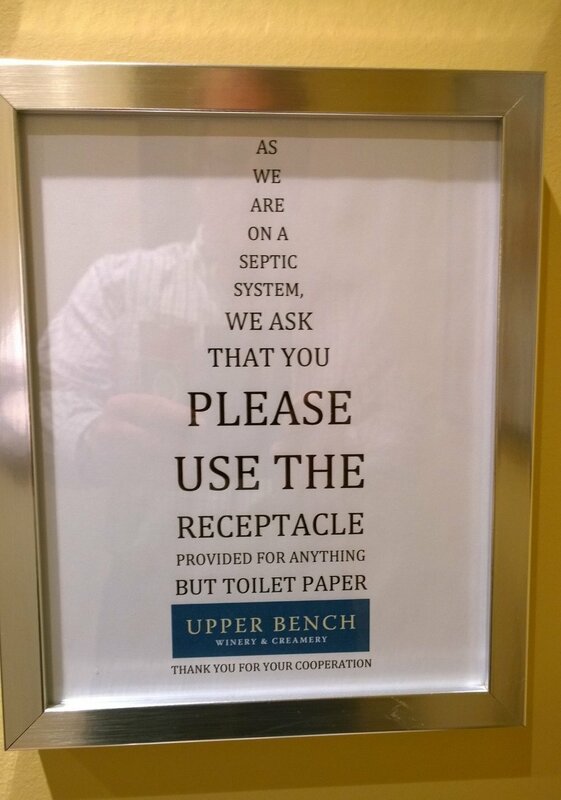 There are several reasons. First, Hunger, along with the sensory taste experiences, helps reinforce meaningful information, memorable experiences, and tangible skills at Woodford Reserve. Being able to swallow the essence of this place provides me with a more holistic view of the bourbon making process from “grain to glass.” Lastly, the attention to detail on the Hunger Dance Steps encourages me to recommend the site to others, and even entices me to consider one more visit. Hunger needs to be an integral part of interpretive design and the visitor experience. A site doesn’t need a special tasting room or millions of corporate dollars to “lubricate social interactions…with food and drink” that connect to the mission and essences of the site. The key resource needed is time and willingness – time for a staff to set a criterion for what it offers to satisfy the visitor’s hunger and a willingness to develop carefully crafted Hunger and taste experiences that connect to the site’s mission. To provide just sell any old food without careful thought for the visitors to take away in their bellies is the easy way out. In Part 2 of “Dancing with Bourbon” we head to the James E. Pepper Distillery in Lexington, KY to look at a different approach to Hunger and the taste experience…stay tuned. Antidotes abound to guard against this common syndrome. In Part 1, we explored how three institutions address this issue. Now, in Part 2, we add into the diversity of experience mix some shaping of that experience through the art of revealing relevance. Want to reduce visitor fatigue syndrome? Antidotes abound to guard against this common syndrome - let’s see how the Frost Science Museum, the Abraham Lincoln Presidential Museum and the Welcome Collection tackled it. We have a lot to share, but we know your time is limited. Get the very best we have to offer - in measured amounts.